Viega, manufacturer of mechanically attached pipe fittings (MAFs) for the maritime industry, recently obtained a type approval from the American Bureau of Shipping (ABS) and an acceptance letter from the U.S. Coast Guard (USCG) for its Viega MegaPress Stainless and MegaPress CuNi piping systems. These join Viega's previously approved MegaPress and MegaPressG systems for use with carbon steel and galvanized pipe, providing a full line of materials-carbon steel, galvanized, stainless and copper nickel. With the new approvals, Viega MegaPress Stainless and MegaPress CuNi products can be specified throughout an ABS-classed vessel for applications that include hydronic heating, compressed air, fire sprinkler, cooling water, low-pressure steam, fuel, lube and hydraulic oil. Viega MegaPress CuNi is a 90/10 copper nickel press fitting system designed for use with Class 200 and schedule 40 copper nickel pipe. MegaPress CuNi has low biofouling properties and resists seawater corrosion to ensure reliable performance. Available in 304 and 316 stainless steel, Viega MegaPress Stainless is for connections with Iron Pipe Size (IPS) stainless steel and is approved for use with Schedule 5 to Schedule 40 pipe. All of Viega's approved press fitting systems provide key benefits for marine and offshore applications by replacing traditional pipe joining methods like welding and threading. Shipbuilders are able to avoid excessive costs by eliminating hot work permits and fire watches. Connections can be made while the vessel is at sea, making it easier and more cost effective to perform permanent emergency repairs. Other trades can also work around the pipe installations, effectively expediting the entire project. Viega's press fitting systems are installed using a hand-held hydraulic tool that gives the installer the ability to press connections in seconds, which can reduce installation time by up to 90 percent when compared to welding and threading. Another significant advantage to using Viega press technology is the ability to make installation and repair connections both wet and dry. Viega offers training and technical support to teach shipyards, marine engineers and owner operators how to convert to press technology. 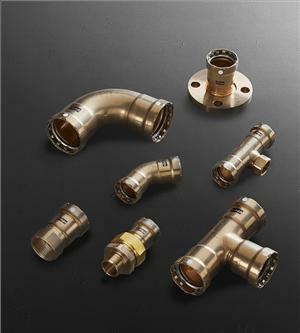 Viega MegaPress fittings are available in both metric and U.S. inch size applications. Viega fittings for marine are tested and comply with the International Association of Classification Societies, so the engineering approvals are already completed.